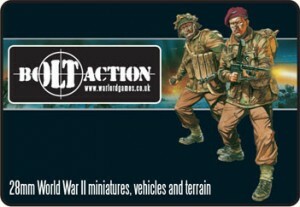 Warlord Games and Osprey Publishing are teaming up to create Bolt Action: World War II Wargames Rules. Written by veteran game designers Alessio Cavatore and Rick Priestley, Bolt Action is a fast, fun 28mm wargame that rewards tactical play, but doesn’t get bogged down with excessive tables and charts. The main rulebook is scheduled for a July 2012 release, followed by a series of books covering the armies of the major and minor powers of World War II. John Stallard, Managing Director of Warlord Games, had this to say: “Osprey has been putting out fantastic books for wargamers for as long as I can remember, and having a chance to work with them on Bolt Action was too good an opportunity to miss. With their commitment to high production values, I know the book is going to be something special. Richard Sullivan, from Osprey Publishing, added: ‘You would be hard pressed to find a wargaming company with more combined industry experience than Warlord Games. We are excited to work with these guys on a game that is supported by such a high quality, extensive, and continuously expanding miniatures line. Warlord Games have previously published the popular Black Powder and Hail Caesar rules, and Osprey has released hundreds of World War II titles over the years, making Bolt Action a dream collaboration between the two companies. 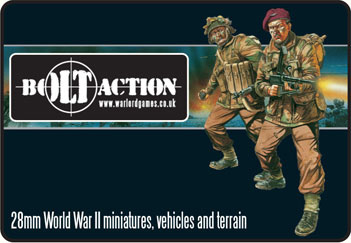 Bolt Action: World War II Wargames Rules will be released in a full-colour hardback edition in July 2012. 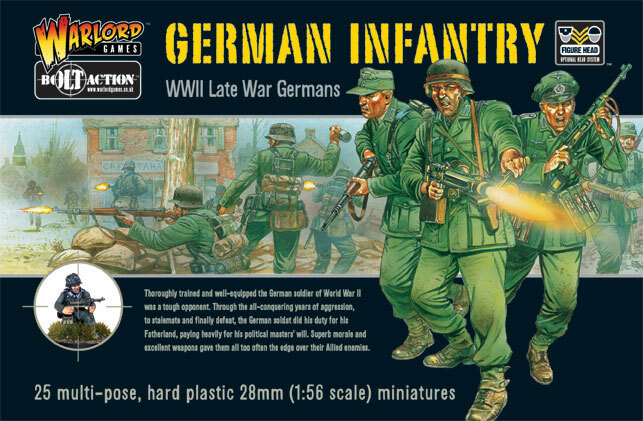 The recently released Germans boxed set was the first plastic kit from the Bolt Action range and we’re great fans of these versatile miniatures. This guide will demonstrate how to get your Germans ready for the battlefield in 5 easy steps, most of which just take a minute or two and involve minimal painting skill. This guide is also suitable for painting characters but you may wish to add extra detail during the basecoating stage. Using the Uniform Grey undercoat spray, apply a even undercoat using sweeping motions across the model or models. Note: Remember to shake the can for at least a minute. Using the various Citadel paints, paint the model using flat colours, i.e. using no shading or highlights. For our German infantryman we used Codex Grey for the helmet, a mix of Chaos Black and Codex Grey for the boots straps and pouches, Fortress Grey for the gaiters, Elf Flesh for the face and hands, Scorched Brown for the rifle stock and shovel handle and finally Boltgun Metal for the metallic parts of the rifle and shovel. The Uniform Grey undercoat is left as it is to represent the German’s er… uniform, a mixture of 80% Codex Grey & 20% Fortress Grey can be used to touch up any areas that are accidentally painted over. The only real detail that was added were the eyes and stripes on the collar. The eyes are just Skull White with Chaos Black spots for the pupils, the collar detail was added using Skull White. In this step we aim to get all the effects that would normally be achieved through highlighting and washing in one simple step. Quickshade dip is a pigmented varnish so in this step you are adding shading and protecting your model at the same time. As this is a varnish it must be used after you have completely finished painting your model. We are using “Strong Tone” Quickshade dip on our German, “Soft Tone” & “Dark Tone” are also available, strong is the medium tone dip. When using Quickshade dip you should dip your model using a pair of pliers and shake it off 5-6 times and then leave for 24 hours (this is why this is an easy painting guide rather than a quick painting guide :)). You can also paint Quickshde on, you will need to be quite liberal with the amount used, also brushes will need to be cleaned thoroughly with washing up liquid when you have finished. To base our German Infantryman we first painted the base Scorched Brown and then added some sand to the base using super glue. We finished off by applying PVA to those areas of the base not covered in sand and giving the base a dip in a tub of static grass. Quickshade dip produces a gloss finish, which most gamers are not too keen on, so to achieve a matt finish we give our model a coat of anti-shine matt varnish. As with the undercoat you should apply a even coat by using sweeping motions across the model or models, once again remembering to shake the can for at least a minute before you start. Bolt Action Germans or Warhammer 40,000 Imperial Guard? Big Orbit games received the photos below in our inbox the other day. 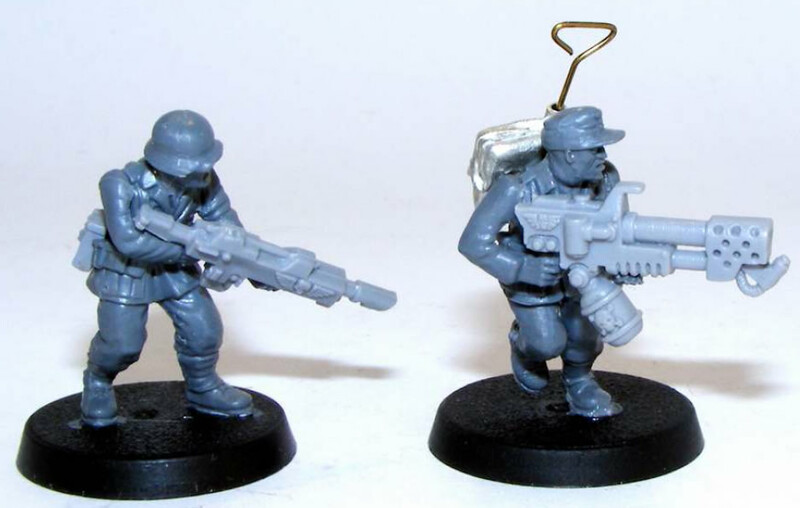 It was inevitable that someone was going to covert Warlord Games’ new Bolt Action World War II Germans into Warhammer 40,000 Imperial Guard. a Flamer. The stocks on the guns have had to be trimmed to fit the smaller German hands and arms, the Lasguns only look slightly large on the Germans, the flamer however looks marvellously absurd and we absolutely love it. 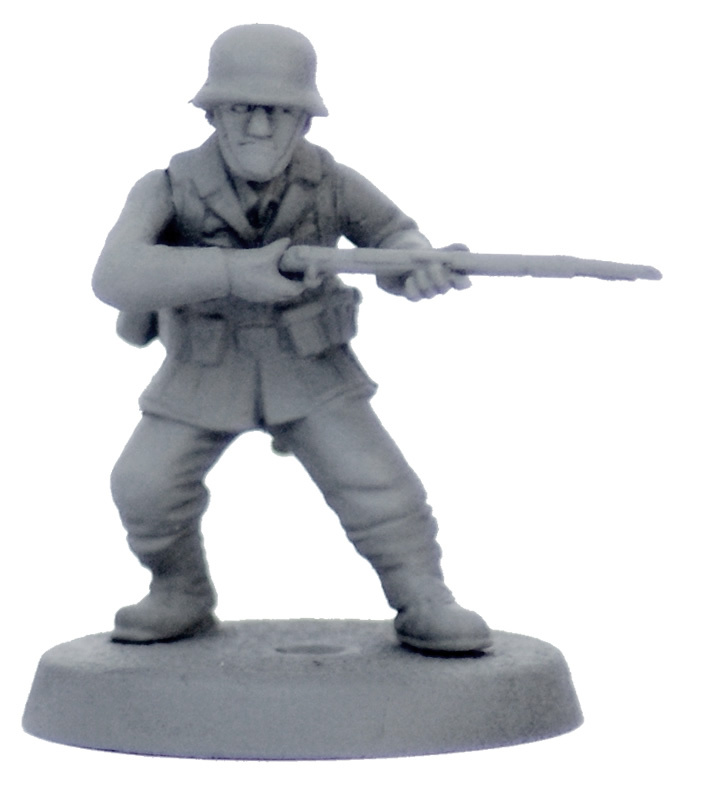 At Big Orbit games we were very excited when we first heard about the new Bolt Action late war WWII German infantry from Warlord Games. 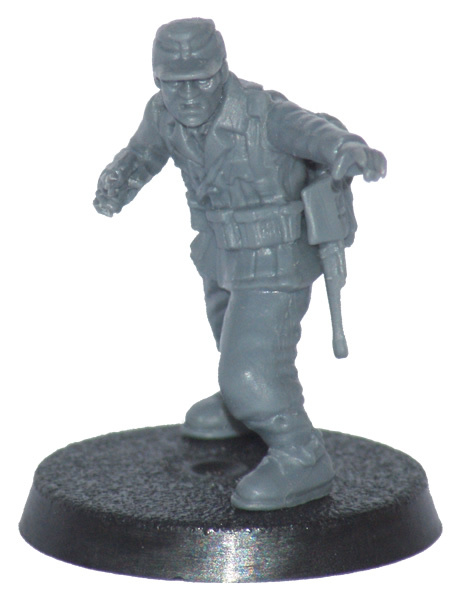 This is the first plastic kit from the Bolt Action range, in fact this is the world’s first 28mm hard plastic multi-pose World War II infantry. 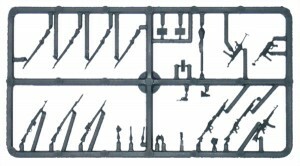 The first thing I noticed after opening the package was the impressive level of detail on the seperate weapons sprue, also the large number of weapons available. The standard issue Kar98K rifle is present in large numbers along with a host of automatic weapons, a pistol and Panzerfaust, along with a large range of accessories. 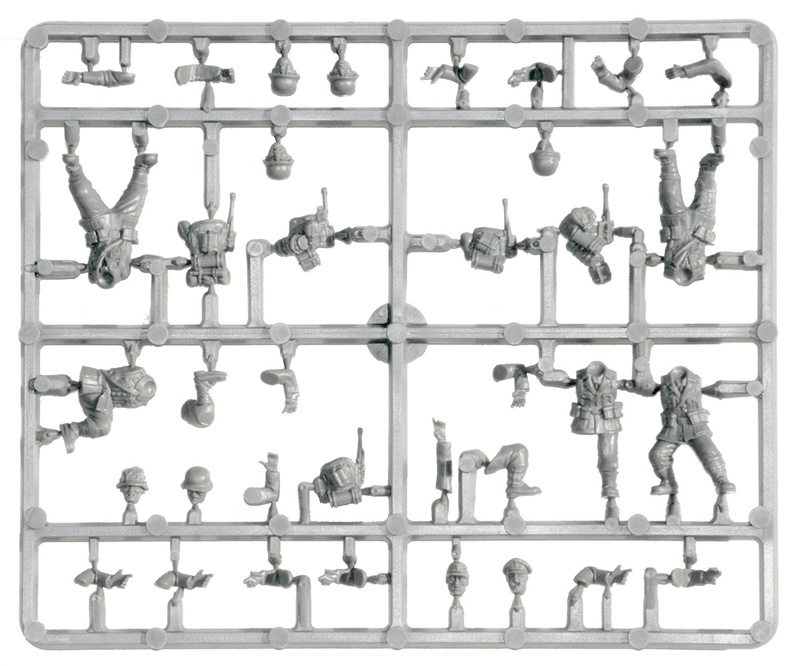 The body sprue also looked promising with 5 soldiers per sprues and with more than enough heads and arms to add lots of variety to your troops. Each box of Bolt Action plastic German infantry will contain 5 body sprues and 3 weapons sprues. 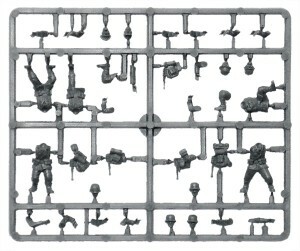 Each body sprue contains 5 infantrymen, 3 single part torsos & legs and 2 with 1 seperate leg, this has been done to ensure good moulding rather than additional build options. So my initial impression of a large number of build options might have been misplaced as there will be quite a bit of repetition in general body form across a box of these miniatures, with 5 of each torso/legs combination in each box. 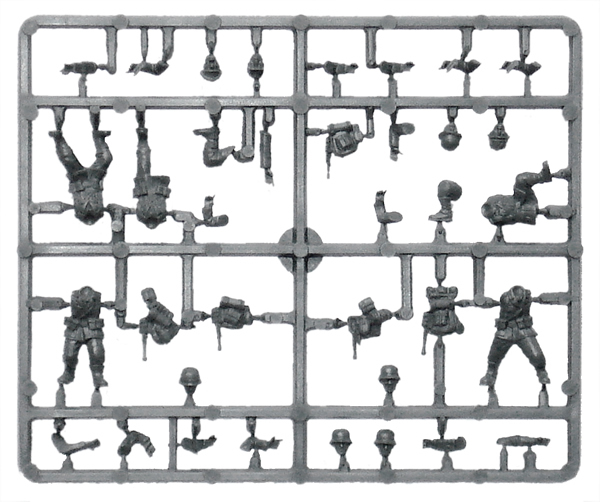 That said, the body sprue includes five interchangeable backpacks, eight different heads and eight sets of arms, so by swapping these it is possible to add sufficient variety that your troops won’t look too samey. 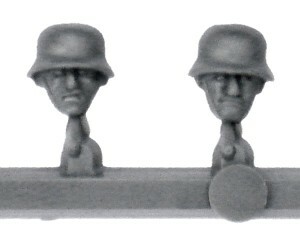 Of the heads available we have six with helmets, one with a field cap and an officers head, additionally the heads are interchangeable with metal heads from the existing Bolt Action range. The number of different weapons available on the weapons sprue is impressive; the standard issue Kar98K rifle is present in large numbers, including variants with a bayonets and sniper scopes attached. Also included is a range of automatic weapons; a MP40 sub-machine gun, a StG44 assault rifle, a MG34, a MG42 and a semi-automatic GW43. In addition to this you’ll find stick grenades, a Panzerfaust, field glasses, Walther P38 pistol, and ammo packs for the MP40. 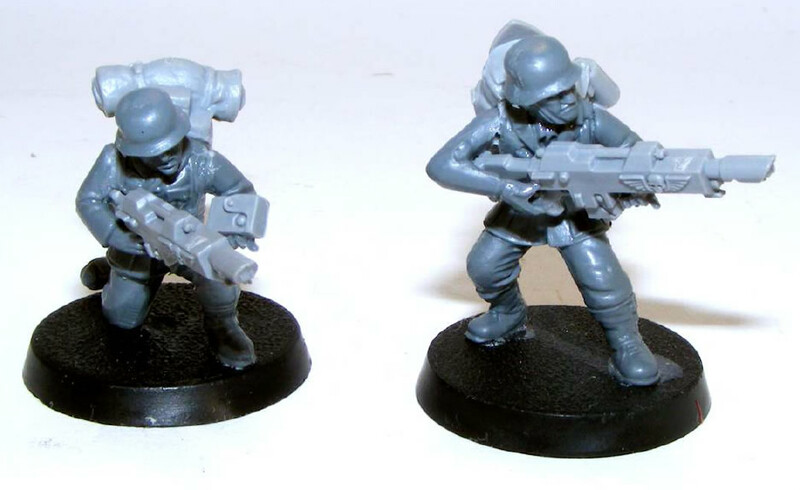 The StG44, MG42 and Panzerfaust mark these troops as late war period (as subtitled on the box), the ankle boots and gaiters worn by these models also place them firmly in the later half of the war. The sculpts are of very high quality with both the soldiers and weapons being very well detailed, and there are few areas where detail has been compromised to facilitate casting, note mention of separate legs to ensure good moulding above. Renedra casts Warlord Games’ plastics and their experience along with intelligent sculpting has delivered some great results. I have seen some criticism of the body sculpts due to the fact that rifle ammo pouches are sculpted onto the models by default, to me this isn’t a huge issue. These being plastic models they can be easily removed to be replaced by MG40 ammo pouches (included on the weapons sprue), this isn’t too much of a chore as the majority of your models should be toting rifles anyway. 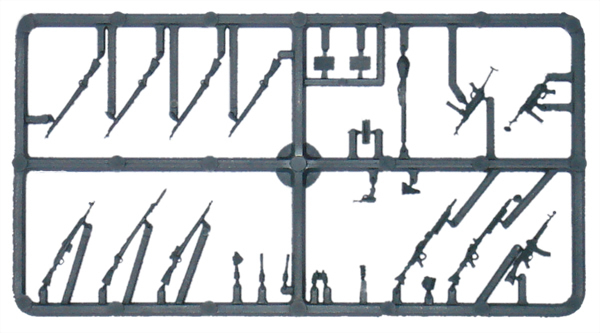 The sprues we were sent had little in the way of mould lines and were relatively easy to put together. Although I did feel I could have done with an extra pair of hands occasionally when getting the arms and weapons to fit together while gluing them but I have this problem with many plastic kits, it’s probably just me. All in all, these miniatures were a pleasure to work with and I’m looking forward to adding more to my collection. Finally on to price, RRP of the boxed set is £20, that equates to £0.80 per model, this is a respectable price point. Metal WWII German Infantry are typically priced between £1.00 – £1.30 and these miniatures will typically come supplied with less options than Warlords’ plastic Germans and being metal will be harder to convert (if required). The Bolt Action Germany Infantry boxed set is an exceptionally well sculpted plastic kit with plenty of head and arm options and a large number of different weapons to choose from. They represent good value for money, at £0.80 per model, and I would recommend them to anyone who collects WWII Germans. These miniatures were a pleasure to work with, being reasonably easy to build and I’m looking forward to adding more to my collection. 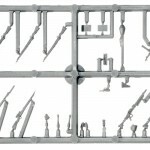 We got sprues for the new plastic Bolt Action Germans from Warlord Games today and before we did a full review, due in a few days, we thought we would get some quick photos of the sprues up for you guys to take a look at. 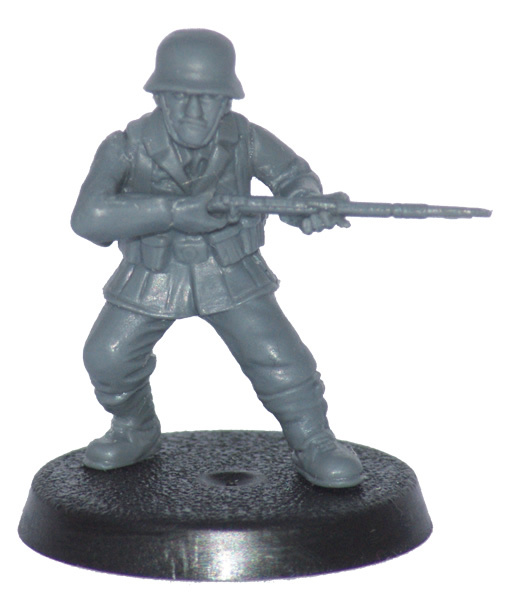 Each box of 28mm plastic World War II Germans will contain 5 troop sprues and 3 weapon sprues. 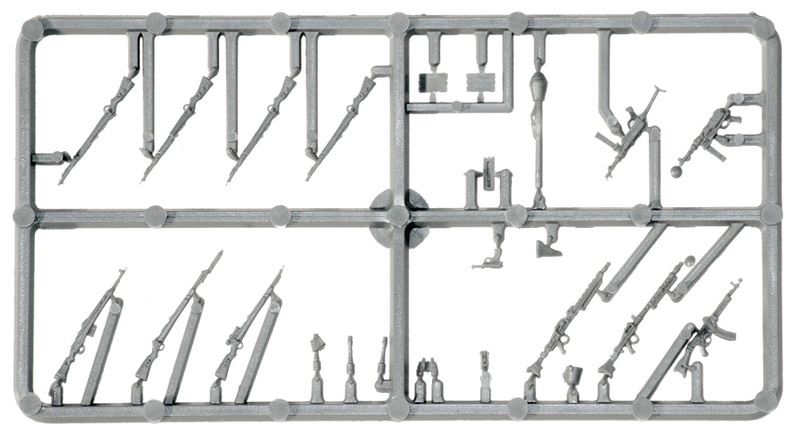 As you can see from this sneak preview the weapon sprue is particularly impressive with a large variety of very detailed weapons available. 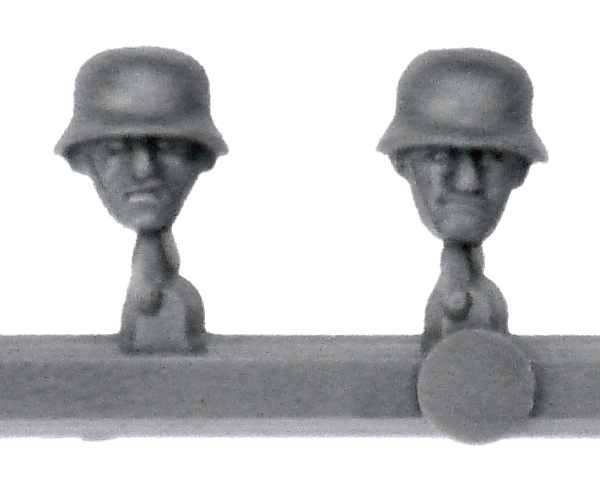 The heads on the troops sprue are also very characterful, see close-up below.